A few days ago I was shooting Brith Party. Actually, I was not shooting the Brith itself, but an after party taking part a few days later. (Heavens help me if I had to shoot the actual ceremony). Since I get a lot of how/what-to-pack questions, I thought that my preparation process is worth sharing via a post. While this may be very trivial for some, it can be a life saver for others. And even if you are doing this for a long time, it is a still a great thinking experiment. Well the uncomplicated truth is that I use Check Lists. Read on to hear how and why. Check lists are useful in many ways. The most obvious one is that the make you check that you are covered in all aspects before going on the shoot. This is a simple process of going over the list and “checking” that every item on the list in the bag/pockets/car or where ever it needs to be. I usually do this by visually confirming each item on the list and not relying on memory. Even if I packed it just a second ago. Making this visual check a habit, helps me keep an un-busy mind to deal with all the other stuff. I don’t have to remember anything, since I know I’ll come to the list alter. I started doing this after reading Getting Things Done which really helped me to get my life back in other ways as well. When you sit down and make a check list, you have to think about what you are taking to the session. This means that you have to think what you’ll be shooting, how will you be shooting it? Will you require lighting gear? Mounting help / lightstands? Are you taking any background with you? A Tripod? Which Tripod? This means that you’ll get help in pre-planning the shoot. Sure, some stuff goes in the list blind folded, Camera, Backup body, batteries and CF cards, but for the rest, it forces you to think about what and how you’ll shoot. How many of us forgot to clean the sensor before a shoot and had to spend countless hours dust specking a bunch of images? Forgot to set the white balance, return the ISO to low before starting a session? If you have a know pitfall put it in the list under an Actions clause. Then when you go over the list, you can verify you’re good. I am not embarrassed to put stuff like “check for tripod plate” on the list. And if you happen to miss something and find out only when you get home from the shoot. Put it on the list, so you can refer to it next time when you prepare the next list. Now that we understand why we make checklists, the question is how to make them? Actually, as with any project, the time it take you to compile a list depends on the size of the project. If this is something that you have done before, maybe you can (almost) reuse an existing list and start the list a day before the shoot. If it is a big project I would start early. At least a week before the actual shoot. This will allow me to get everything that I need till the day of the shoot. It will also allow me to add things as I “suddenly remember” like that I must have a smoke machine for the shoot. I learned that the more time goes by, the more comprehensive my lists get. One rule that I always follow is to never start the list on the day of the shoot, even if I have a full twelve hours. There is something in the sleep between creating the list and the next days that helps making it more complete. 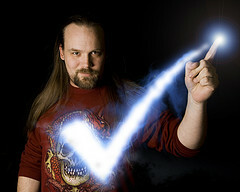 While any format for a checklist will do, I recommend using something that you can A – take with you and B – edit easily. If the list is with you, you can add items on the go. Say, if something comes to mind while you are at a meeting. And the ability to edit (ie. 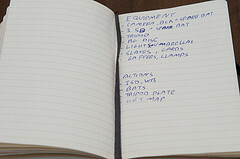 add/remove items on the go will help you keep the list alive and not forget anything till you get to a “save point”). I personally use a small moleskin that I always carry around. iPhone apps will also work, and so will an A4 sheet in the bag. I would not recommend an excel file or a similar thing, since those can only be edited down when you are near a computer. As I said, I recommend starting the list at least one day before the shoot, or longer if you require planning. Sit down for a few minutes and think about all the stuff you need. Making some dedicated time for this is sometimes enough to get the list right. And you still have a few days to add items as you go. You can also use the list to “push” action items still open, like “buy balloons”. You can watch thethe list I used for that Brith session a few sections back (click to enlarge). As you can see it has both the content of my bag as well as my pre shoot check list (ISO, tripod plate, …). My lesson is that if weight is not an issue and you can’t decide on an item, add it to the list. It is better to leave it in the bag than to wish you’d brought it in the first place. How do you prep for a session? What are the items you always have in your list/bag? Do you have any common pitfalls that a check list can help you avoid? Share with us in the comments.